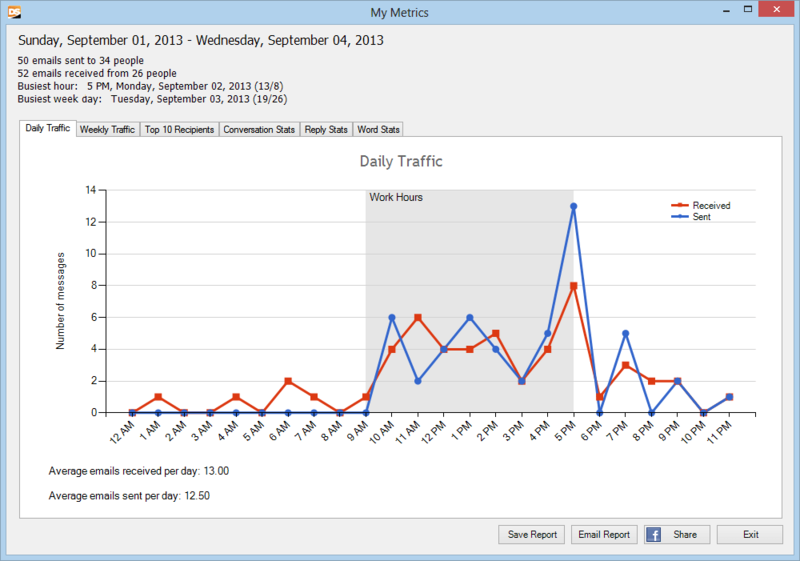 — daily email traffic stats: how many emails did you send & receive per day? which are your busiest email hours? — weekly email traffic stats: how many emails did you send & receive per week? which is the busiest day of the week? — top 10 recipients: which are the contacts that you communicated the most with? — conversation stats: how long are you email exchanges? What is the average number of emails exchanged for a subject? — reply stats: how fast do you reply to emails? how often to you reply to received emails? 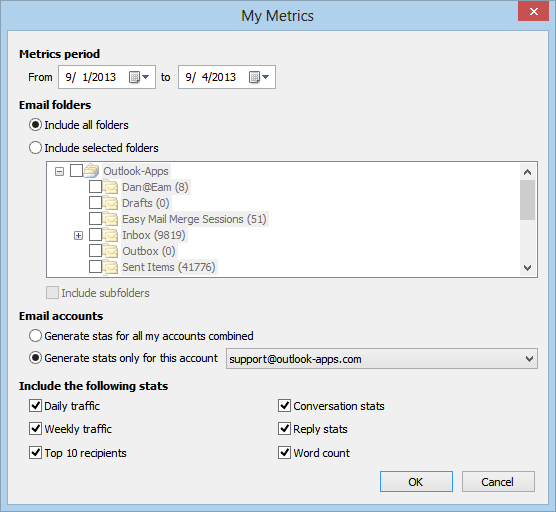 — word stats: how long are your emails? how long are the emails you’ve received? For future reference, you can email your stats, you can save them as a local HTML file or you can just share them on your Facebook wall. Email Statistics: what’s the point of them? Well, if your daily routine revolves around Outlook emails, you should want to have access to hard facts revealed by such email statistics! This way, you can learn a lot not just about your own email behaviour, but also about your contacts’ behaviour – which, in return, allows you to properly understand your email workflow and you can properly decide if & how to change your email habits. Do you tend to reply too late to emails? But are you at your desk when you receive most of your emails? Do you spend a lot of time writing replies? But are your replies much longer than the emails you are replying to? All such questions can be answered using Outlook email statistics. 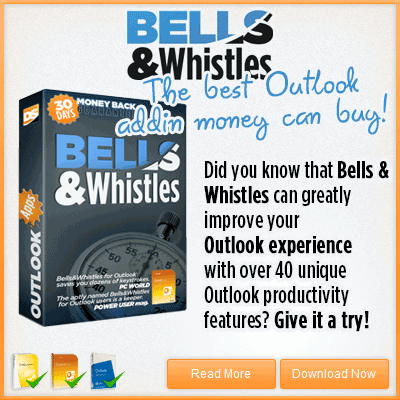 On top of its email statistics engine, Bells & Whistles also features several productivity enhancements for Outlook. Here is a complete features list.